 Typically, a stair runner or rug will be cut from a wider piece of carpet i.e. 4m or 5m wide. 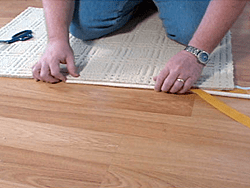 This will mean it has raw edges, which will easily fray and require carpet binding. 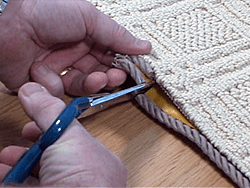 There are various options to make your own rug, including over-locking stitch (like a basic blanket stitch) and adding a rug binding e.g. tapestry or sisal. However, both these methods are not particularly attractive and add significantly to the cost of the runner. 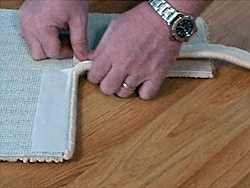 The Easybind carpet edging can be used to convert any width, style and most qualities of carpet into a made-to-measure stair runner or rug. 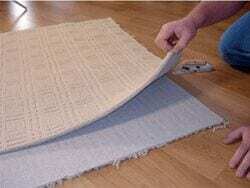 It can also be used with many types of natural flooring, including sisal. 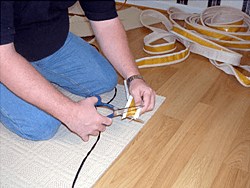 The rope-styled Easybind is applied to the reverse of the carpet, neatly locking in the loose fibres of the raw edges and adding an attractive, narrow edging strip to the stair runner or rug.  Whilst the names may be deceiving, the colours of this range of carpet binding provide an excellent selection to complement or contrast any style of plain or patterned carpet.  Choose from either the standard colours in the rope edging or the Deluxe colour range in the rope edging – the latter have an attractive, additional sheen to the fibres.  The versatility of Easybind means that any design and width of carpet can be transformed into a smart stair runner without detracting from the carpet design with unsightly over-locking yarn or wide, decorative borders. The fixing method is discrete and durable and is suitable for both residential and commercial installations. The choice of over 30 colours provides a popular selection of plain hues and stripes, which can provide a contrasting or coordinating feature with the body carpet. Made from strong synthetic yarn, Easybind carpet binding has a subtle silk finish, which complements most yarns and natural flooring. 2. When Easybind is cut the rope part will fray, so apply Sellotape around the rope and cut through the middle of the tape. 3. Always start in the middle, not a corner, as it is easier to join two pieces on a straight section. 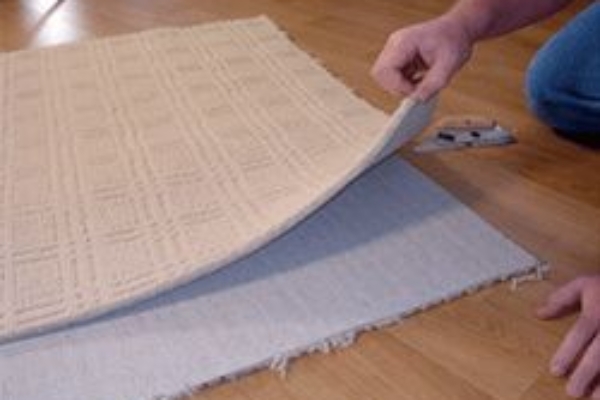 Peel tape and press into the carpet backing as you go, as shown above and below. 4. 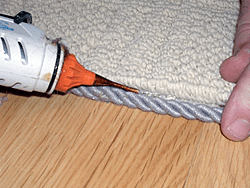 It is important to run the rope parallel to the carpet edge, leaving sufficient gap between the carpet and the rope for the glue gun nozzle. 5. When going around a corner, cut the binding, not the rope! As shown above. 6. 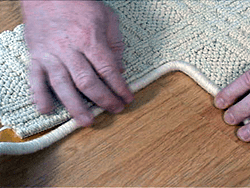 Corner technique shown from below the carpet. 7. When going around an inside corner, cut the binding, not the rope! 8. This makes a seemless finish. 9. 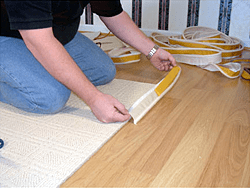 When joining the start and end of the carpet binding, apply Seelotape to the area where the cut will be made. 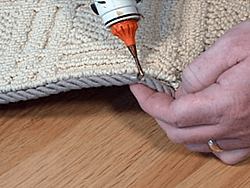 This helps prevent the rope from fraying when cut. 10. When the binding is cut, match the rope pieces together. Have the ends of the adhesive tape visible, in order to allow easier removal. Seal the two pices of rope with a spot of hot glue, then peel away the Sellotape. 11. 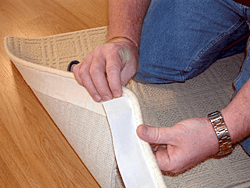 When you are happy with the join and corners etc., use the glue gun to apply a bead of glue between the binding and carpet backing, pinching together as you go. Be extra careful not to get any glue on the carpet. 12. 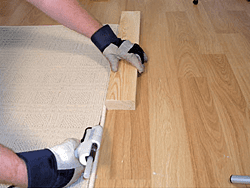 For large runs, try a piece of timber to help attach large sections of the carpet binding. 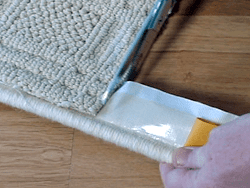 Use a glue gun mat to catch any glue that may drip from the end of the gun.